I have been very interested in the history of the American Indians of the Great Plains, especially during the period of 1630s (when the Plains Apaches started riding the Spanish New Mexico on horseback) to 1868) ( the second Treaty of Fort Laramie). I especially enjoy the period literature written by the traders, trading companies officials, and mountain men and travellers written during the late XVIII and first half of the XIX century, during the so called Fur Trade period on the Plains. 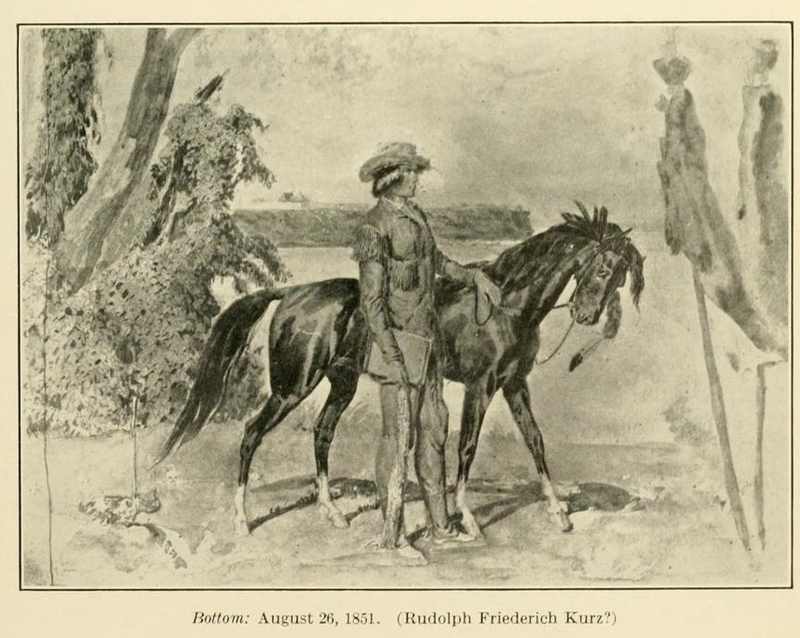 The Journal of Rudolph F. Kurz belongs to this class of sources, and yet is more unusual than the most, for it was written by an artist who perennially short of funds came to the US via New Orleans, and then worked his way up the the trading posts of the American Fur Trade Company where lived and worked on the Upper Missouri, drawing the tribal peoples and writing about his life on the Plains ( including working under the boss Edwin Thompson Denig, whose life and work will become the subject of some posts, I hope - via archive.org library collection). ple with whom the Mormons came in contact. which had broken out just before he reached this country. and of the officers of these trading posts. long ago passed into oblivion along with the buffalo. and so he willingly excused the Indians for their foibles. their wealth in splendid idleness, while the fine arts languish. me, if I was to attain to mastery in a single one of these subjects. to make up my mind which would be the best field for my work. lence of antique art — yes, still more, to equal Raphael's master works. the country above all others that would serve my purpose best. must devote myself to prolonged study in art. account of the whole action. serve at the same time to cultivate his taste.